Each year, with the arrival of spring, Alexandru adds another rose to his life’s bouquet in celebrating his birthday. Alexandru was surrounded by his friends and colleagues from Don Orione Association and the group shared wonderful moments together. 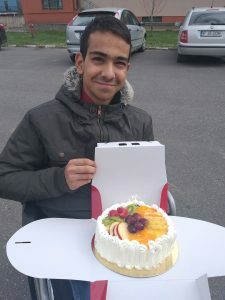 At school, Alexandru had another surprise prepared by his classmates, as they organized a small party for him taking advantage of the fact that this year his class will graduate from high-school so they won’t see each other as often after the end of the school year ceremony and Baccalaureate exam. Alexandru is going through intense moments, working hard and getting ready for the most important exam in his life. He is determined to get good grades and also his degree, very important for his next steps, especially in choosing the next route he would like to pursue. Another surprise came from his friends from Children in Distress who visited him to bring a delicious cake and to celebrate with his colleagues and friends at the Association. Alexandru got a new pair of shoes, a considerate present sent by big-hearted people, Peter Jenkins and Christine Cook. Alexandru was delighted to be reunited with CID’s reps and confessed that the shoes will come in handy, especially as he is looking forward to outdoor activities organized with his friends from Don Orione as the summer months are swiftly approaching. Health wise, Alexandru is feeling better and following his dialysis sessions, he recuperates faster despite having to go three times per week at the hospital for these sessions. Alexandru was very moved to be in the centre of everyone’s attention and would like to send all of his gratitude to everyone who stopped for a moment to think of him. We all hope he will get his Baccalaureate diploma and continue his studies as he is a bright young man who deserves the best life has to offer.